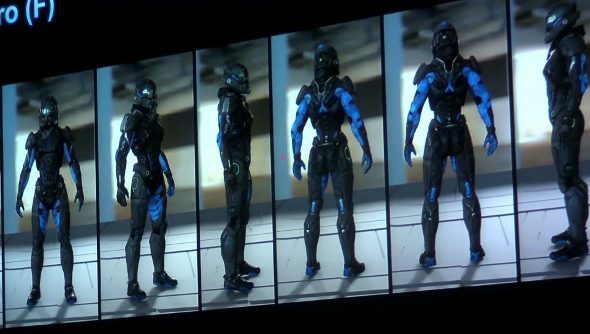 The Mass Effect panel from San Diego Comic-Con, where we got to see our first look of the new Mako concept, has been posted by BioWare in its entirety on YouTube. The entire thing was pretty vague besides the concepts for the Mako and armour designs, mainly because very little has been locked down at this point. “We’re years away from being able to say this is the exact game we’re making,” stated Mass Effect producer Mike Gamble. So there’s not much to the 30 minute panel. Since you might not have half an hour to spare when pickings are so slim, take a gander below for some highlights. Most of the panel was taken up by the Q&A, but before that, Gamble and crew showed off the Mako, described by Gamble as a point-to-point vehicle, bouncing around a winter wonderland, and some beefy armour for both male and female human characters. The armour looks a lot like the gear from Mass Effect 2 and 3, but a little more intricate. Notably, there was barely any difference between the male and female versions. When asked by an audience member about casual wear, and if the female version would be less revealing, the panel expressed their desire to maintain parity between the genders in terms of costume. While there were no details about the setting or when the game will take place, Gamble does confirm that players will be visiting new, uncharted places. “We’re building a game about exploring places,” he said. “We want to give players new spaces to explore and uncharted areas that haven’t been explored before.” There’s definitely a Star Trek vibe. Mass Effect Not 4 will also have new races, though what they are remains a mystery. “The big thing is that you get that diversity, and you can have different character interactions and romances with various species,” explained Gamble.